Pebble's long-rumored new smartwatch officially launched today, and all of the rumors were true. 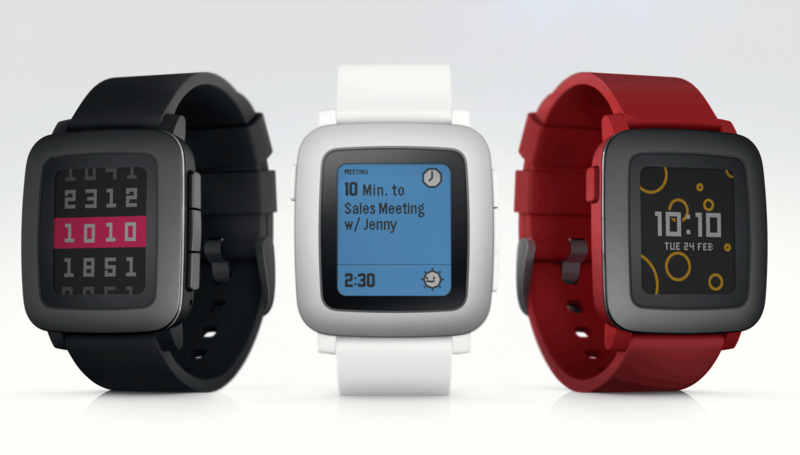 The Pebble Time is launching to pre-orders on Kickstarter, with a price of $159. This smartwatch is thinner but slightly bulkier than previous models, and it's the first Pebble watch to feature a color screen. The Pebble Time sports a 1.26" color LCD display (screen resolution of 144 × 168) which was probably made by Sharp - just like the grayscale screens used on earlier Pebble models. The Pebble Time also has a microphone, a layer of Gorilla Glass over the screen, and a water-resistant shell. Update: Nope. The Pebble Time uses an LCD screen from JDI. The new Pebble Time can match all of the features of the current models, and it goes a couple steps better. Pebble is promising that this watch has the same 7 day battery life and all the same software features (including support for the 6,500 apps developed for Pebble), but it can do more. The charging port on the back of the Pebble time doubles as an expansion port where 3rd-party developers will be able to attach sensors, including biosensors and GPS. These accessories don’t exist yet, but Pebble thinks hardware companies will make them. The Pebble Time also features a new Timeline which "organizes relevant information like notifications, weather, news, travel, and reminders chronologically". Users will be able to scroll back through their notifications to see what you've missed. And last but not least, the microphone can be used for quick text replies, or it can be tied to note-taking services like Evernote and used for spur of the moment dictation. All in all, this is a major improvement on the original Pebble, but let's be honest. The new Pebble Time is , hardware wise, about on par with other models on the market. It has better battery life than most but that is a fleeting advantage that Samsung, LG, and other companies are working to overcome. Nevertheless, Pebble has a distinct advantage. Unlike Android Wear, which is limited to Android smartphones running Android 4.3 or above, or the Apple Watch, which will only work with iPhones, Pebble's smartwatches work with everything. That's going to give this maker a leg up on its competitors, and the stable of 6,500 apps which have already been developed for Pebble won't hurt either. I found the resolution through Slashgear, and Googling on it turned up that Sharp listing. Yes, I know that screen I linked to is not what you would describe as epaper, but then again the last screen was also called epaper. It was an LCD screen made by Sharp. I’m double checking this with Pebble. FYI: The Verge called it a color epaper LCD screen. And the Sharp web page calls it a Transflective LCD which is more accurate. Jeeze… Can’t they get their story straight? pebble won’t answer any questions about the screen.